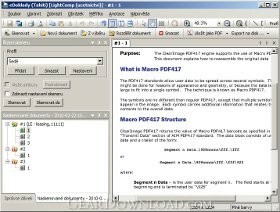 eDocuments Scan - Sophisticated program for document scanning and export to PDF. * Smast Quality Control - the application automatically selects the most suitable compression and other settings for the scanned document, however the image is still available in other compression levels and user can select another one. * Adaptive threshold - a technique to preserve the readability of the text when converting the image to the black-and-white format. * Deskew - detection of the inclination of the scanned image and its automatic correction. * Post-scanning operations - e.g. the rotation function can be applied to every scanned image. * User modules - custom modules can be add, e.g. to remove specific background. This download (eDocumentsScan-5.6.13.0-en.msi) was tested thoroughly and was found 100% clean. Click "Report Spyware" link on the top if you found this software contains any form of malware, including but not limited to: spyware, viruses, trojans and backdoors.